3/21/2014Share this story on Facebook! IC students have created a way for people to find local artists whose music aligns with their tastes. 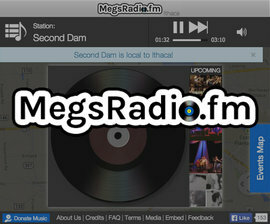 MegsRadio.fm is an ad-free, nonprofit, personalized Internet radio system. Computer science professor Doug Turnbull is the creator of the site, named after his wife, Meg. The idea was further developed by Ithaca computer science students Richard Roberts ’12 and Kris Stensland ’14, communications students Alex Spirgel ’14 and Alex Wolf ’14, and music students Andrew Horwitz ’13 and Steve Meyerhofer ’15. Similar to the popular service Pandora, MegsRadio.fm takes the music of well-known artists and shuffles it with the music of local artists. Listeners can hear their favorite popular artists while being introduced to local Ithaca musicians. The site also collects data from users to improve their experience.